The best bodyboard for big guys is designed exclusively for big, tall, or heavy riders. If you’re a big guy, you need a board this is wide and tall enough, while also being highly durable to achieve peak performance. While bodyboards were once limited to average 42 inch long boards, today’s boardboards range in size, shape, and overall appearance. 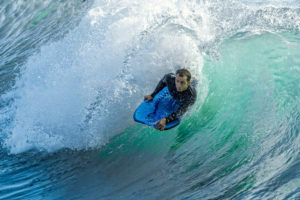 Size is one of the most important aspects of purchasing a bodyboard. When the board is held out in front of you, the bodyboard should reach from your knees to your chin. Heavier riders require extra width for better buoyancy in the water. You’ll also want to choose a board according to your abilities. If you’re a new rider, get a beginner’s board. With the right bodyboard, even big guys can ride the waves like their smaller surfer counterparts. As bodyboards range in size, style, and price, we’ve made the decision-making process a little easier on you. Here’s a look at some top-rated options for the best bodyboard for big guys.